Unable to let go of the memory of her missing sister, Suzanne, and eager to bring some sense of closure to her family’s pain, Annie Bird (Tanaya Beatty) travels from her home in Moosonee to Toronto to retrace her twin’s steps and find the answers she and her family desperately crave. Don McKellar (“The Grand Seduction;” “Child Star”) directs this adaptation of Joseph Boyden’s Giller Prize– winning novel. Overcoming her reluctance about leaving her mother, Mary-Lou (Tantoo Cardinal, “Angelique’s Isle”), and encouraged by her uncle Will (Brandon Oakes, TV’s “Arctic Air”) to take a break, Annie eventually agrees to join her friend on her trip to Toronto. Despite her initial hesitation, Annie is soon drawn into investigating the clues the city holds of her sister’s disappearance and strikes out on her own to follow the trail. While Annie is away, Will faces his own challenges at home. The consequences of Suzanne’s connections to local organized crime and Will’s friendly relationships with the local police force make him a target for violence and intimidation and eventually lead him to take measures into his own hands to protect his family. 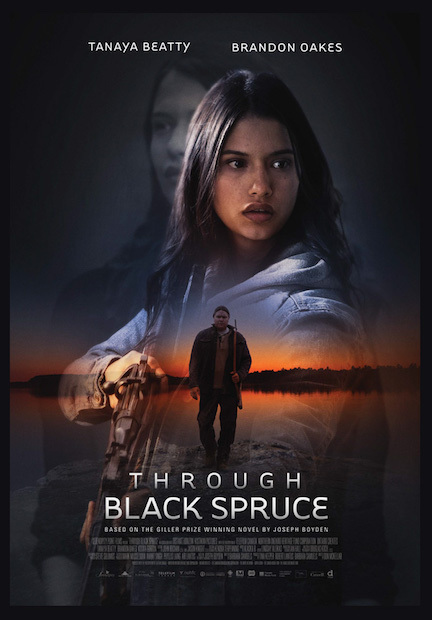 Anchored by Brandon Oakes’ performance as Will, “Through Black Spruce” demonstrates the indelibility of family bonds, the complex and far-reaching nature of our communities, and the pervasive impact of colonialism on Indigenous peoples in Canada.